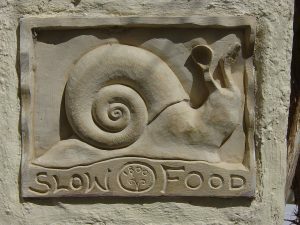 Slow Food, is an international organization that promotes “good, clean and fair food for all.” UW’S chapter of Slow Food is a non-profit student run organization focusing on locally sourced, sustainable food. Students can choose to be very involved or minimally involved with the range of opportunities within the organization. There are semester internship programs or one time only volunteer options such as prepping for Slow Food’s weekly dinners. To experience Slow Food’s delicious food for yourself you can join students and Madison community members for inexpensive meals at Slow Food’s Monday Family Dinner Nights and Café Wednesdays during the school year. For $5 you can get a three-course meal (dessert included) Monday’s at 6:30. The Wednesday café menu runs from 11:30-2:00 and with items between $5-$8 it’s a great option for an inexpensive lunch break between classes. The café and dinner menus change weekly based on seasonal products so they are guaranteed to be fresh! With great food, opportunities to work with kids or learn how to cook, Slow Food provides opportunities for everyone. Seriously check out their Monday dinner nights and Café Wednesdays next fall – you won’t regret it!